Yesterday is another country. Borders are now closed. But Sometimes the Past Memories come back to haunt you. The borders are permeable. There are holes in the fenced bricked walls. Thoughts within the intricacies of the mind have no fear of protective barbed wire. They weave over and around like ghosts through cemetery gates. As much as you attempt to put the past behind you it hangs onto your coat-tails and sticks like fly paper. Where you move it goes. Forever your shadow real yet intangible daring you to leave it behind because you both know it, they, the memories, flaws and failures will always be a part of your life like skin to bone. Muscle to fiber and tendon. You can never forget. Swift Rivers carry bodies downstream to surface with the Spring thaw. Sacrifices for the Funeral Pyre. Brigaider Jaynes. He went insane. Not all at once. But in bits and pieces. Dying upon tracked grill. For the rats to get there fill. Leftovers charcoal broiled. Pigeons, Roaches and rats gather for a feast. He once went for Reyna Angelica. Ms. Lady who did a pole dance with a tracker trailer at the intersection of a State of Insanity. Stopping traffic for miles around. His Fiery Frame set to blazing coals. His disembodied entrails offerings to the Underground rat-tail gods. Char-Man ~~ A Jumping, Jaggling, Waggling, Corpse doing a Macabre Jig inside the tunnel. A Sign Shouted Danger/Peligroso! For Gotham is a Bi-Textual Town. Another of the Mole People succumbs to the savageries of Life. At Dusk when the warmth of the Sun has ceded to Night’s chill, Char Man comes to me offering to turn my bed into a living breathing fireplace with me as one of the perpetually burning logs. His eye never quits straying from my side. The Eternal Inferno Burning Spectrum infests my dreams like creeping ivy and mold. I am just an observer. If he can’t have Laura will he take me? And so it begins once more. Oh Laura! Where have you gone?! Hypnos, Morpheus and Phantasos mock me!! Phobetor, god of nightmares is my Deity. I’ve suffered from Nightmares, Insomnia, Night Terrors and as an adult Sleep-walking. 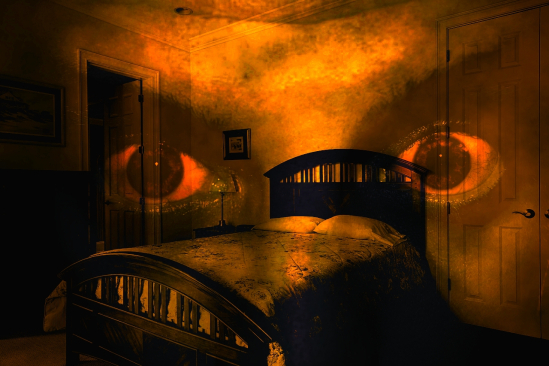 When I was younger I used to see demons at the foot of my bed and felt some type of demon or evil being sitting on my chest! Thankful that finally went away. However Sleep has rarely been peaceful or restful for me! The Man from Another Place is Waiting for you!! For at Midnight all Black Cats are Grey and Dying men sometimes transmigrate into lesser animals. For you see I am not from Gentleness but from War. I am the Midnight Marauder a Succubus come to steal men’s souls as they sleep! Fascinating as I’ve suffered from Nightmares, Insomnia, Night Terrors and as an adult Sleep-walking. Sleep has rarely been peaceful or restful for me!